Nova Microdermabrasion Quilted Fabric Hammock with Pillow, Spreader Bar Portable Outdoor Camping Hammock for Patio Yard Heavy Duty?450lbs Capacity? Product prices and availability are accurate as of 2019-04-20 13:42:41 UTC and are subject to change. Any price and availability information displayed on http://www.amazon.com/ at the time of purchase will apply to the purchase of this product. There's nothing better than relaxing to the rhythm of a swaying hammock in your own backyard. Our quilted hammock comes with a soft pillow so that you can swing away in comfort. The quilted fabric hammock will accentuate any backyard or outdoor area. Package Size: 56" x 5.7"x 5.7"
Bed Size: 75" x 55"
Wood Size: 55"x 1.5"x 1"
Pillow Size: 44" x 12"
? Premium Material: Made of soft durable UV & weather resistant polyester fabric with inner cotton padding and a polyethylene stuffing head pillow offer superior comfort,strong cotton ropes suspends the hammock with sturdiness that won't falter under fidgety tosses and turns. ? Solid-wood Spreader: A hammock's wide frame is typically dictated by whether it is constructed with hardwood spreaders or not. For a broad, bedlike product,55" durable hardwood spreader bar with powder coated in an oil rubbed finish protects from rot, mold or mildew, making it more stable and maximizing style. ? Extra Large: This spacious 135" X 55" frame supports up to 450lbs for two adults, so no one gets left out on the swinging fun;Beautiful fabric design featuring striped pattern is a treat to eyes and deeply relaxing during usage.Drifting away with ease under the warm embrace of the summer sun is wonderful! ? Fast & Easy Setup: Crafted with a pillow which can easily be detached and replaced,giving you easy control over your neck support,Strong cotton ropes suspends the hammock with sturdiness that won't falter under fidgety tosses and turns,12 inch chains for easy setup.Serve as a secondary source of relaxation that provide as much comfort as the primary. ? 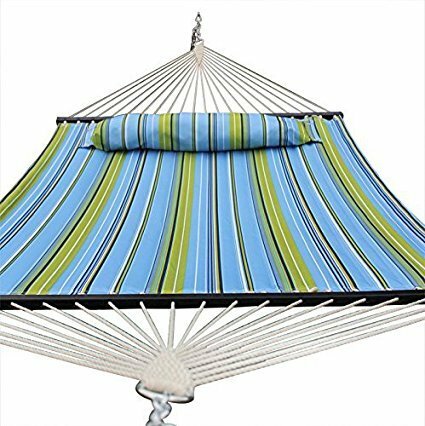 Wide Use: This rope hammock can be hung indoor or outdoor, it's perfect for garden, patio, backyard, balcony and more when you reading, relaxing or sleeping. It offers many ways to lay or sit in it,with zero pressure on whole body. You can enjoy it with your family or your friends. It also makes an awesome gift for anyone.